How to access Lit shader properties through code? Currently i'm using HDRP in my project, so i have a question. How can i access Lit shader properties through code ? Or where i can see names of variables in this shader ? HDRP is still under heavy development and all the code is still in flux. Even if you find some code that works right now chances are it will stop working very soon. That's why there aren't really any tutorials/etc for HDRP code yet. Really, the safest shader method right now is to use Shader Graph. But... you can find the source code for all the SRP/Shader Graph stuff here. The particular variable you highlight in your screenshot is called _BaseColorMap for the texture part and _BaseColor for the color part. Where those variables are used depends on the rendering path you have selected and which features you have enabled in the shader. Once the code stabilizes it will be easier to point to specific bits of code to show what does what. I'm looking forward to that myself. Not the answer you're looking for? Browse other questions tagged unity shaders graphics or ask your own question. 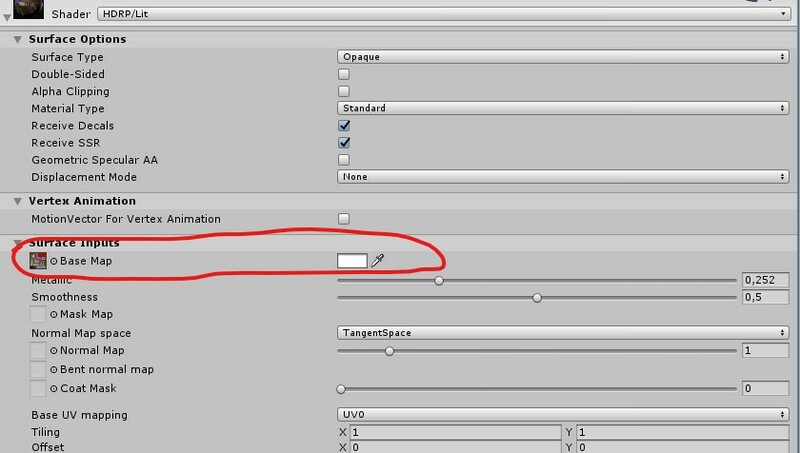 How do I gain access to objects in order to change their properties in Unity? How can shader code duplication be reduced in Unity? Change Shader on This Material Via Code? Unity: Can objects override shader/material properties?